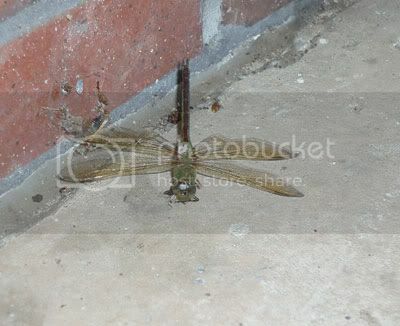 Sad and a little gross - our campus is covered in dead dragonflies. There is a preponderance of dead dragonflies in the breezeway between the Enrollment Services buildings. It’s quite disturbing. I tried to take a picture, but the area is pretty dirty from all the feet that trek through here daily, so it’s hard to see the gruesome details from my shots. Trust me, it’s really icky. 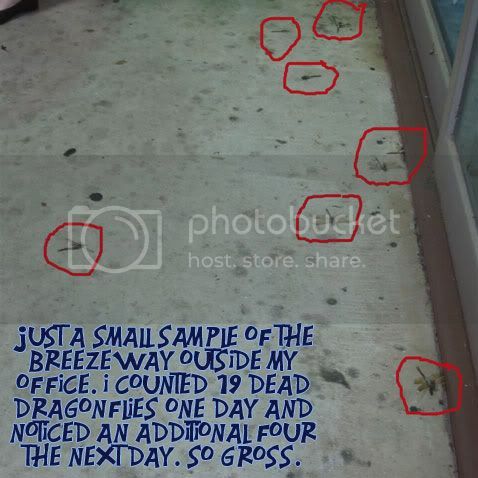 One day my coworker and I counted 19 giant dragonflies flattened on the ground plus one stuck in a cobweb near the skylight. Isn’t that excessive? That’s a higher number even than the other day when Michael and I joked about forming a “Screw the Whales – Save the Dragonflies” conservation club. Now I’m wondering if something really could be done – I feel so bad for the creatures. I wanted to do something for them, so I thought I would try writing a poem. I partially succeeded with writing one bad haiku plus two moderately okay haiku. When caught in amber – lovely. I bet it's because of the change in the weather. It's been really cool lately. Hopefully it's not from bug spray or anything. We lost some really cool bugs because of that in FWB. It COULD be that it's just time for them to die and you've maybe had a lot of them this year. They don't live very long. Yeah, I'm going with that. To sad otherwise.